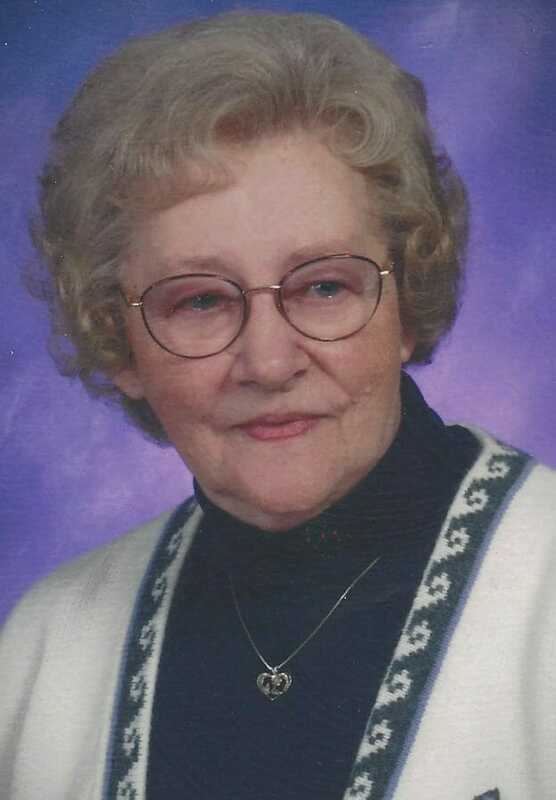 Mildred Rose Lies, 97, of New Rockford, ND returned to the loving arms of her Creator on October 26, 2018. She was born August 5, 1921 in Foster County, ND to Peter and Sophie (Zuling) Wobbema. She was baptized at home, was confirmed at Trinity Lutheran Church in 1937 and attended school in the Carrington area. Mildred married Raymond Nicholas Lies at St. Joseph’s Catholic Church near Bremen in 1940 and they farmed in Wells County until 1974. Mildred was gentle and soft spoken, a true partner and peace maker on the family farm. She helped in the fields during harvest time with tools, food, and special treats like ice cream malts and root beer floats. She excelled at baking, sewing, and making a large house into a home for her family. Her gardens flourished and beautiful flowers were her joy. Her love for children was a constant through her life. She never hesitated to stop and smell the frequent gift of “daddy lion” flowers, praise and give thanks with a big hug. Ray and Mildred moved to New Rockford in 1974. Mildred’s generosity continued as she volunteered to drive friends to events, clean at church, and serve lunch at the Senior Center in town. Mildred moved to the Lutheran Heritage Center in 2011. Mildred is survived by ten children, Carol (Jim) Padden, Dianne (George) Laber, Rita (David) Albers, Peter Lies, Tim (Emily) Lies, Alyce (Bill) Ebele, Annette (Steve) Hoornaert, Valerie (Jeff Peasley) Lies, Richard (Barbara) Lies, and Paul (Debra) Lies, 39 grandchildren, 75 great-grandchildren, and two great-great grandchildren, brother Harold Wobbema, and many kind nieces and nephews. She was preceded in death by an infant daughter Mary (1958), husband Raymond N. Lies (1978), grandson Raymond J. Lies (2013), two infant grandchildren, four infant great-grandchildren, parents, Peter and Sophie Wobbema, sisters, Margaret, Emma, Pearl, Jennie, Nellie, Helen, Ann, Susie and brothers, Henry, Peter, and John. Mildred will be laid to rest beside husband Ray and baby Mary in the family plot in Hillside Cemetery, Fessenden, ND. Visitation: Tuesday 9AM to 4PM in Evans Funeral Home, New Rockford and will continue from 5-6 PM with a rosary at 5:45 PM and parish prayers at 6 PM all in St. John’s Catholic Church, New Rockford, ND. Funeral Service: Wednesday, October 31, 2018, at 10:30AM in St. John’s Catholic Church, New Rockford, ND. Jim and Carol: Our sincere sympathy to you, on the passing of your mother, Carol. The days will pass, but the memories are always with us. she will always be in my heart and I will never let her go.